I did not post DIY project for some time and I am due to do that. As you can see, the variation of making bracelets from silk are endless. 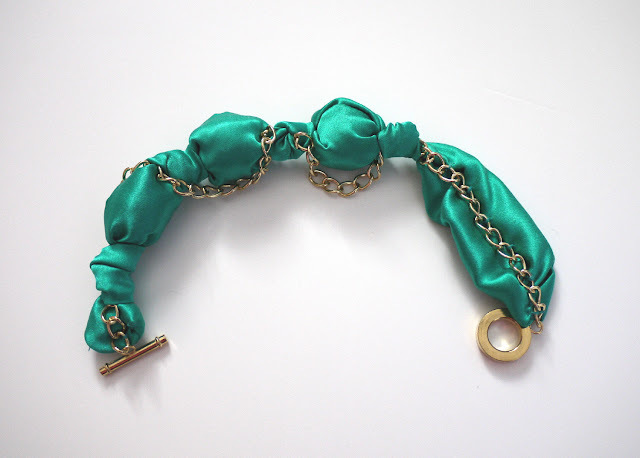 To make it happen, the only things you need to have is silk fabric, sewing machine to make a tube out of fabric (although it can be done by hand), toggle closure of your choice, small wooden beads, maybe some golden chain accent, thread and needle and Voila! I like to wear this silk bracelet with one string of white fresh water pearls. I think it creates nice contrast with intense turquoise color of the silk and allows it to stand out even more. The combination of turquoise, pearl and gold also reminds me of Byzantine style jewelry, which I love. Nail polish OPI Kiss on the Chic, #NLH31. White large leather clutch in my hand - my DIY project as well, I will talk about it in my later posts. How did you make this? Did you just use an old bracelet and build the fabric around it? I like it a lot! No, I did not use the old bracelet. It is actually very easy to make from scratch. The concept is the same as my DIY silk bead necklace http://bit.ly/HAqEZ7 The only difference is that since I used small wooden beads for the bracelet, I cut a strip of silk of about 3" wide, not 5.5" like I did for the necklace. As far as length of this strip of fabric, I cut it apprx. 25" long, just to be on the safe side. Then made a tube by sewing one side, LENGTHWISE, keeping short ends open. Then I dropped one small wooden bead into the tube, and tied the knot on both sides of the bead. Then I added two more beads, one on either side of the firs one and separated by the knot again. Total 3 beads. Also, just to make it pretty, I put little gold tone chain through the knots very loosely that i hangs a little bit and give some movement. As you can see I did not fill up this bracelet with beads, I wanted some fabric to lay flat on my wrist. Then I finished open ends by hand with thread and needle and attached toggle closure.